Two goals from Will Grigg and a blinder from Gavin Massey saw Wigan Athletic record a thoroughly deserved victory at pre-season Championship promotion favourites Stoke City. Latics had been denied a total of three points thanks to stoppage-time goals in each of their last two matches, against Aston Villa and Nottingham Forest. But they were out of sight well before the closing stages at the Bet365 Stadium, thanks to a magnificent performance from start to finish. After weathering a City storm, Latics took the lead when Grigg finished off a wonderful right-wing cross from Massey just before the half-hour. Five minutes later, Massey himself doubled the lead with a superb individual goal that silenced the home crowd. Grigg made it three on 57 minutes, converting from the spot after Nick Powell had been fouled in the box,. And Stoke’s misery was compounded with 13 minutes to go when on-loan Everton defender Ashley Williams was red-carded for a second bookable offence, following a lengthy run-in with Powell. The result puts Paul Cook’s men on seven points from their four matches played, heading into Saturday’s trip to crisis club QPR. Latics had flown out of the traps, and had half a shout for a penalty with Powell appearing to be blocked in the area. Grateful for the let-off, Stoke went straight up the other end and striker Benik Afobe raced clear before slotting past Christian Walton. Although the flag was up on the near side for offside, replays showed the striker was level at worst - a most welcome let-off for Cook and his men. Latics were given another warning when Tom Ince fired just over from distance, before former Latic James McClean’s cross was scuffed wide by Afobe. There followed a game-changing passage of play which undoubtedly favoured Latics, and helped to contribute to an increasingly toxic atmosphere inside the stadium among the home supporters. First, a McClean free-kick appeared to hit the arm of Cedric Kipre in the Latics wall, but referee John Brook waved away Stoke shouts for a penalty. Then, seconds later, McClean looked a certain scorer as he flew inside for a dream right-wing cross, only for the stretching Afobe to completely ruin the opportunity for him. And Latics duly rubbed copious amounts of salt into the wounds by going in front with their next attack on the 27-minute mark. Massey’s cross from the right was inch-perfect for Grigg, who did well to hold off his marker before steering the ball home from close range. With Stoke still attempting to grasp what had just happened, Powell came close to making it 2-0, only to lash the ball over from the edge of the area. Goal number two wasn’t long in coming, however, with Massey doubling the advantage on 32 minutes. The winger did most of the work on his own, waltzing around a couple of challenges before accepting a lovely return pass from Powell. England goalkeeper Jack Butland advanced, but Massey slotted the ball under him with power and precision. Latics could and perhaps should have been out of reach by half-time, with a Powell free-kick fizzing over the top with Butland struggling to get there. 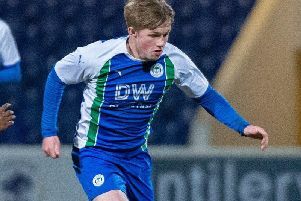 Then, on the stroke of half-time, Wigan’s growing comfort in the game was shown with both full-backs getting forward into the Stoke box, Reece James’ cross rolling agonisingly in front of Antonee Robinson. Latics picked up where they’d left off at half-time, and if Powell’s delivery from the right had been better for Grigg, the Northern Ireland striker would have had a tap-in. Grigg did have his opportunity to add his second goal - and third of the campaign - just before the hour mark, when Powell was mugged as he attempted to get on the end of a Robinson cross. The official pointed to the spot, and Grigg - for the second time in four days - smashed the penalty down the middle to beat the diving goalkeeper. Jacobs and James were unable to make the most of decent chances, with the home fans by now taking out their anger on their side and, more specifically, manager Gary Rowett. Callum Connolly, Callum McManaman and Josh Windass came on to add fresh legs in the last 25 minutes, but the home side had long since run out of ideas. The only fighting spirit seemed to be coming from centre-back Williams, who was involved in several run-ins with Powell, one of which saw both players booked. Another couple of collisions saw him skating on very thin ice, which eventually cracked 13 minutes from time when the Wales defender smashed Windass - catching Massey as well - which saw him walking off even before he was shown a second yellow. Wigan Athletic: Walton; James, Dunkley, Kipre, Robinson; Morsy, Evans; Massey, Powell, Jacobs; Grigg. Subs: Jones, Byrne, Bruce, Connolly (for Grigg, 65), McManaman (for Powell, 81), Windass (for Jacobs, 76), Vaughan. Stoke: Butland; Edwards, Shawcross, Williams, Pieters; Allen, Fletcher, Incem, McClean; Berahino, Afobe. Subs: Federici, Etebo (for Fletcher, 72), Adam, Martina, Crouch (for Berahino, 64), Bojan (for Ince, 46), Souttar.